Before diving in any type of description of the e-commerce scene, we have to point out that the German economy has seen better days. The national economy avoided ending 2018 in technical recession by a very close margin. More so, as analysts see it, the situation is not going to get better anytime soon, especially judging by the growing tensions between major players of the global market, an underperforming automotive industry and some other unpredictable factors. Of course, this situation directly impacts the evolution of online retail stores and their performance. Fortunately, the e-commerce overall status seems to respect the trend of the last few years. Although at a macro-economic level the situation in Germany is looking rather grim, the e-commerce sector, as shown above, is expected to grow. Apparently, 34% of German online customers intend to spend more money online in 2019 than in 2018. 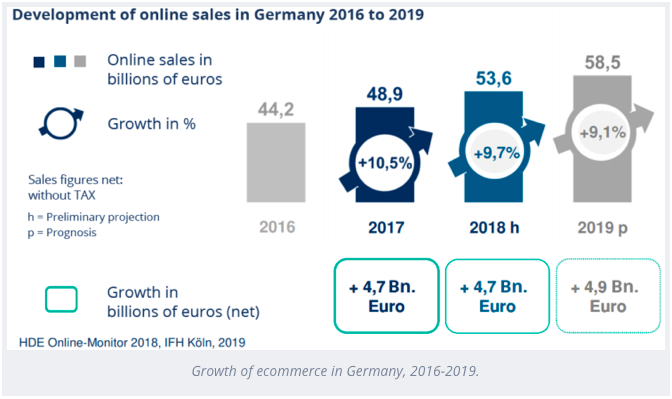 Nevertheless, though currently in expansion, Germany`s e-commerce market is expected to grow at a slower pace than in 2018. On the one hand, this trend is sustained mainly by two sectors, fast-moving consumer goods and DIY & garden, which are recording the biggest growth. On the other hand, matured sectors such as fashion, consumer electronics and hobby& leisure are expected to grow at a slower pace. (Compared to last year`s dynamic). 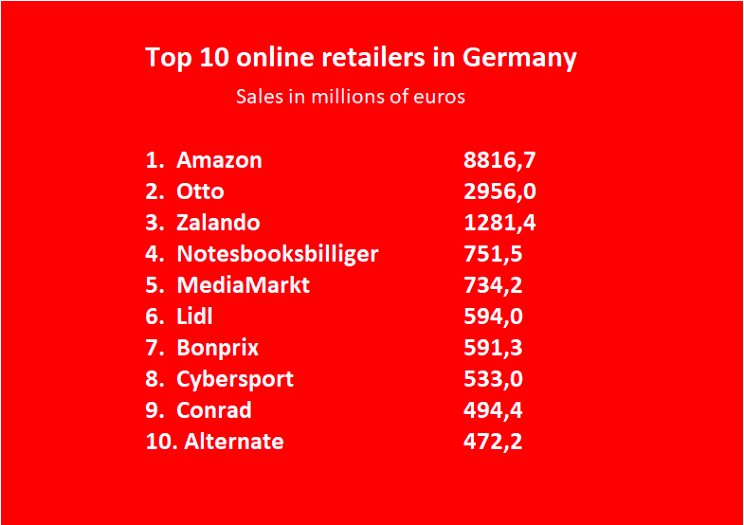 The three biggest e-commerce players on the German market are Amazon.de with a turnover of €8.8 billion, Otto.de with €3.0 billion and Zalando.de with €1.3billion. Combined, the turnover of these three giants makes up 43% of the total revenue accounted by the top 100 online retailers in Germany 2018. Another thing that is worth mentioning is that 68 of the top 100 players operate one or more brick and mortar shops. 57 of these businesses entered the retail sector with physical shops and afterwards expanded with online stores. Only 11 players started by doing business exclusively online and opened real life stores after that. Nevertheless, a trend seems to be taking shape: online success tends to predict the emergence of real life stores. This last piece of information is of great interest for the Sether team. A business that runs both physical and online shops will have to diversify its advertising efforts. This means that marketing teams all over Germany will have to deal with an even more complex mix of channels, ad spending and KPIs. Sether is dedicated to creating a single nexus-like platform to govern every single aspect of a company's marketing efforts. Track, monitor, optimise and make decisions using an AI powered interface. We cannot end this article without mentioning the most important event for Germany`s e-commerce scene, the E-commerce Berlin Expo. The stars of the show at the 2019 edition seemed to be machine learning, blockchain technologies and their applications in the e-commerce industry. Another hot topic of the event was the diversification of marketing channels and the challenges/opportunities this reality poses to both marketers and business owners. Not only that marketing tools are diversifying exponentially, but customers also tend to spend more time on a wide variety of platforms, besides the consecrated ones (Facebook, Instagram, Twitter etc.). Inline with the remarks of the previous paragraph, this dispersion marks the transition from multi-channel to omnichannel marketing. In terms of performance, this is good news; in terms of campaign complexity, not so much. It is a great opportunity for both e-commerce businesses and media monitoring and campaign governance platforms such as Sether. Complexity can be transformed into a competitive advantage!